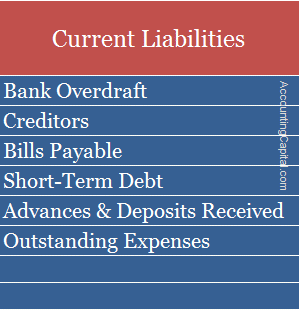 Home Liabilities What are Current Liabilities? Obligations of a company which are payable within a year or an accounting cycle of a business are called current liabilities. They are either settled by current assets or by the introduction of new short-term liabilities. Examples include Overdraft, Creditors, Short-term loans, Outstanding Expenses, etc. They are shown on the Liabilities side of the balance sheet. They play a vital role in the control of the working capital of a business, WC = CA – CL, therefore, more of such short-term obligations mean less working capital and vice-versa. It is also the denominator when looking at a company’s current ratio thus playing an important part in its liquidity. It is imperative to keep a check on such short-term liabilities. 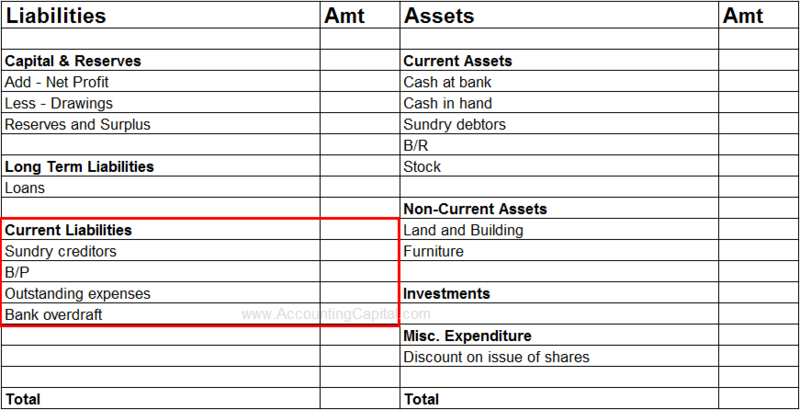 They are shown in the liabilities section of the balance sheet.